Keyboards are most commonly dismissed as just a piece of peripheral for a computer. Nevertheless, it has gone through a lot of innovation over the years. And, iterations of its technology are now widely available in the market, targeting many different demographics. It has gone through a lot of facelifts as well to match the evolution of the modern computer designs. Today, we can see keyboards that are built for gaming and some that are designed attractively to match modern computer aesthetics. Some didn’t really stay far from the original design and function but remained more competitive in its niche. This is true for keyboards built for typing. You’ll often hear about gamers using mechanical keyboards. This is because of the accuracy of a mechanical keyboard, its responsiveness, and its durability. However, mechanical keyboards are not just purely designed for gamers. Whether you are a regular typist, transcriber, programmer, or blogger, mechanical keyboards are pretty much the best option for a keyboard. Das Keyboards are notorious for always topping every list of best keyboards in the market year on year. They are the go-to keyboards for most gamers – and typists. And that’s because of their superb make and extremely innovative capabilities and features. The Das Keyboard Model S Professional Clicky MX Blue Mechanical Keyboard is keyboard best suited for typists than gamers. You can absolutely the lettering on each key. It showcases the same features as its brother, the Das Keyboard Model S Ultimate Soft Tactile MX Brown Mechanical Keyboard. In addition, the Das Keyboard Model S Professional Clicky MX Blue Mechanical Keyboard boasts of additional features that include anti-ghosting technology, two USB ports and laser-etched inscriptions on each key. Like many mechanical keyboards, the Das Keyboard Model S Professional is highly durable it can potentially last a lifetime. It assures you of 50 million key presses lifespan before it will finally give up on you. The Das Keyboard Model S Professional will never fail a typist’s hunger for that clicking sound every time the fingers hit the keys. Besides the crunch, the keys feel light to the fingers and the responsiveness of each key results to higher accuracy when typing. This mechanical keyboard is compatible with both Windows and Mac OS. The Razer company has established a core in the gaming hardware industry because of the superb design and features of its products. They’re very well known among gamers across the world. Nonetheless, the Razer company has built a keyboard that transcends gamers’ needs to typists and other heavy-typing industries. Their Razer BlackWidow Ultimate showcases 10-key rollover support as well as an ergonomic design allowing for effective soft presses on the keys. The Razer BlackWidow Ultimate has become really popular with gamers around the world because of its high responsiveness and light touch, reducing any strain and fatigue on fingers. The pricing for the Razer BlackWidow Ultimate is not bad nor too costly for anyone who’s already invested so much in a powerful gaming rig. What’s more amazing is that this keyboard can last up to 80 million keystrokes. What makes the Razer BlackWidow Ultimate an eye candy for typists and/or other people who do a lot of typing is its fundamental and ergonomic design. You’ll be assured to keep your fingers and wrists healthy the whole time you are using this keyboard. Though it doesn’t have anything fancy for aesthetics, but it challenges other keyboard models by its backlit keys that enable anyone to still have high visibility of the keys even in pitch black situations. 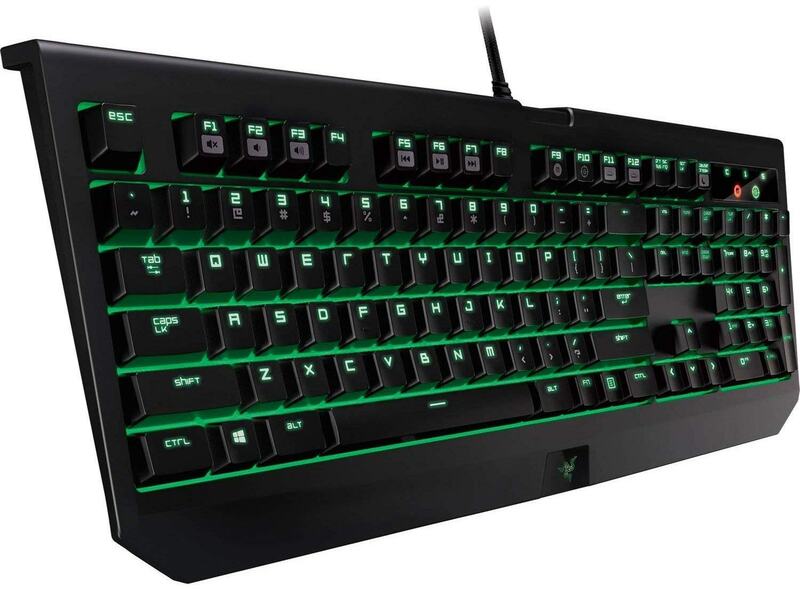 Moreover, the Razer BlackWidow Ultimate boasts of a unique keyboard feature only a few of its competitors offer – the ability to program each individual key. This feature enables you to assign words or even phrases to any key, making it easier and so much faster to complete a typing job. The Razer BlackWidow Ultimate is also compatible with both Mac OS and Windows platforms. The Das Keyboard Model S Ultimate Soft Tactile MX Brown Mechanical Keyboard is the closest sibling to the Model S Professional that offers heavyweight features for a keyboard designed for typing, let alone more demanding keyboard work. It is easily one of the most popular mechanical keyboards in the market today and most often has a huge following in the gaming industry. By far, the Das Keyboard Model S Ultimate Soft Tactile MX Brown Mechanical Keyboard is considered to be the typist’s dream keyboard. It allows for an amazingly superb keyboard typing experience in all aspects. It has one of the quickest response time for a keyboard owing to its use of gold-plated keys. Its ergonomic design makes it the best fit for anyone out for a long typing work. The keys are considerably soft to punch reducing any strain and fatigue of the fingers. On top of that, the Das Keyboard Model S Ultimate Soft Tactile MX Brown Mechanical Keyboard offers a surplus of many different multimedia keys. At first look, you will be surprised not find any letters or engravings on the keys of this keyboard. The whole concept being introduced by the Das Keyboard Model S Ultimate Soft Tactile MX Brown Mechanical Keyboard is that by having blank keys, you will be able to type faster making you’re a hundred times more efficient. Of course, this comes with a deep familiarity of the QWERTY keyboard layout. Otherwise, it will be too difficult for you to identify which key goes for what letter. The Das Keyboard Model S Ultimate Soft Tactile MX Brown Mechanical Keyboard is cleverly designed for professional typists – and it offers a lot of value adds for them coupled with additional convenience and old-school luxuries. Speaking of old-school, the IBM Model M has come back from the 80s keyboard grave. Touted as the world’s original tactile keyboard, the IBM Model Mis bringing back its former glory to the late 2010s era. The revival of this old-school heavyweight was brought about by a significant number of mechanical keyboard enthusiasts who got frustrated by the inconveniences and disadvantages of the standard keyboards being sold in the market today. The IBM Model M has shot back to fame and is now a top choice in the best keyboard for typing category. It is being sold and distributed by Unicamp. The IBM Model M offers the same big and loud features it offered when it first came out back in 1984. You’ll be amazed by the familiar – if you existed around those years – buckled clicking sound with every punch of the keys. It’s simply classic at its best. Don’t be fooled by the nostalgia that the IBM Model M brings as it shows off very practical features, such as durability, responsiveness, and accuracy. You can smash the IBM Model M onto your desk and you’ll be assured it will remain intact and working. That is a testament to its durability. The IBM Model M is the exact same keyboard 30 decades back with all the exact layout and set of keys. It is only compatible with Windows operating systems. The Rosewill RK-9000 Series is a close competitor of the Razer BlackWidow Ultimate within the gaming world circles. Though it is originally targeted to and designed for gamers, the Rosewill RK-9000 Series will surprise typists with its superior quality switches that utilize Cherry MX Blue mechanical controls. It is unquestionably excellent for huge and demanding typing work. The Rosewill RK-9000 has a heavy make assuring you that it will not easily slide around your desk. It comes fully equipped with rubber pads fixed on the bottom to hold the keyboard in place. Aside from the usual features offered in mechanical keyboards, the Rosewill took a step above on its durability. It utilizes a gold-plated USB connector to protect it from potential damage and corrosion. The Rosewill RK-9000 is ultimately designed to combine comfort and durability. It has a very easy and light feel to the fingers and the whole keyboard layout is generous enough to offer comfort to your fingers and wrist. It will be offered in 3 other Cherry MX switches in the future, such as brown, black, and red switches. There’s no denying that the Rosewill RK-9000 will become a top choice for both gamers and professional typists. 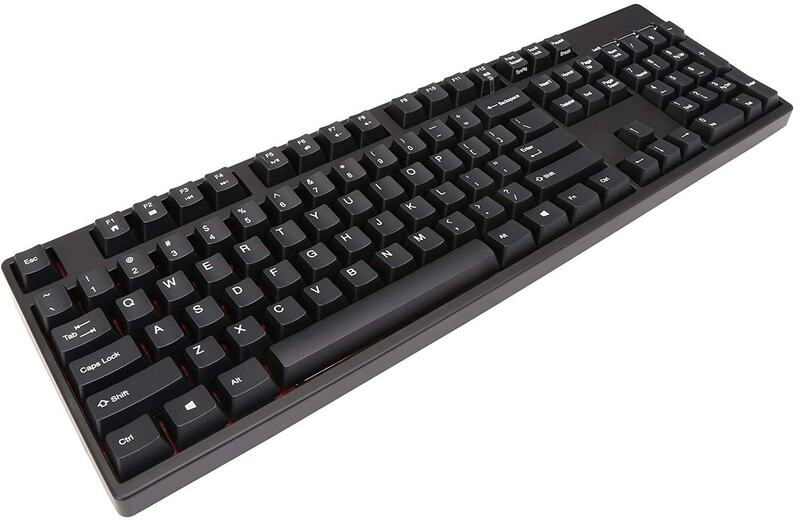 The EagleTec KG010 Office / Industrial LED Backlit Mechanical Keyboard doesn’t rely on the standard Cherry MX switches but rather on its custom-built mechanical switches, which enable the keyboard to deliver far superior performance as well as durability compared to most keyboards in the market today. Its manufacturer declares that it can last longer than any of the most durable mechanical keyboards available in the market today. Besides the radical technology innovation, the EagleTec KG010 Office / Industrial LED Backlit Mechanical Keyboard provides great ergonomics and applaudable backlit feature for heavy-duty and long-lasting typing job. The EagleTec KG010 Office / Industrial LED Backlit Mechanical Keyboard may look awkward but it actually delivers according to basic typing needs. It is fast, responsive, light to touch and promises twice the accuracy among its contemporaries. Perhaps, the greatest feature of the EagleTec KG010 Office / Industrial LED Backlit Mechanical Keyboard is its ABS plastic and aluminum combination that ensures their place-mounted keys are up to the most demanding and roughest typing job. The EagleTec KG010 Office / Industrial LED Backlit Mechanical Keyboard also showcases its splash-proof design, promising any user that the keyboard will never malfunction even when droplets of liquid splash over the keyboard’s surface. The Ducky Shine 3 offers the same set of features offered by most top keyboards in the list. What makes the Ducky Shine 3 stand out is its customizable LED backlighting choices that you can configure to up to 7 different colors. It looks more modern and contemporary than the rest of the other keyboards in the list and even on the market today. The Ducky Shine 3 offers considerably generous spacing between keys allowing for free movement when typing. In addition to that, the Ducky Shine 3 has very durable and is made of highly resilient plastic and metal materials. It comes with 4 Cherry MX switches, such as the blue, black, red or brown switches. The Ducky Shine 3 is compatible with both the Mac OS and Windows operating system platforms. It is not too heavy and not too lightweight, making it very convenient to carry without having to worry about weight. At the same time, the Ducky Shine 3 offers great ergonomics and performs well from an efficiency standpoint. There’s a wide variety of keyboards in the market today. It can be a little daunting to go through catalogs of keyboards to really know each item’s feature, functionality, and capability. Not to mention, reading the reviews about each of them. Sometimes, review ratings can be deceiving, especially if most of the reviews talk about late delivery, prices, DOAs, etc., and less about the keyboard itself. For starters, there are what is called membrane keyboards and mechanical keyboards. Membrane keyboards are the new, contemporary keyboards available in the market today that come in modern and sleek design. They’re often wireless keyboards with additional features and extra buttons for more capabilities. Some of these keyboards are very handy that you can carry around easily without worrying too much of its baggage space or inconvenience. The thing about membrane keyboards is that they don’t have individual switches under the keys. Rather, rubber domes are used, which is spread across the bottom of the keys to capture motion and/or action from the keys through an electrical circuit. There’s a high likelihood for the domes to get overly sensitive, which could create unsatisfactory results for a typist. Membrane keyboards or sometimes called monobloc keyboards have become a de facto keyboard style by most manufacturers today. Mechanical keyboards, on the other hand, have individual switches under each of the keys. Every motion or action forced on each key is captured by its own switch making it more accurate. Typing is also proven faster and easier with mechanical keyboards. Not to mention, they last longer than their membrane counterparts. This old-school loyalist can give you the satisfaction of an audible clicking sound every time your finger punches a key. On a manufacturing standpoint, mechanical keyboards are costlier to produce compared to membrane keyboards. However, there’s been a recent renewed interested over mechanical keyboards because of the overweighting pros that they have. Not all mechanical keyboards are created equal. There’s also a wide variety of mechanical keyboards out in the market today. It is very critical to understand your need and preference – most gamers prefer an easier way to double-tap while typists look out for audible clues and tactility. Why are mechanical keyboards best for typists? Mechanical keyboards offer a broad range of advantages for typists. For one, mechanical keyboards reduce the potential occurrences of typographical errors. In addition, mechanical keyboards are proven durable than other types of keyboards. It is a peripheral that can even outlast your computer. While standard keyboards nowadays have a capacity of 5 million key presses, the lifespan of mechanical keyboards goes up to 50 million presses before it starts to break down. And since mechanical keyboards utilize single, individual switches under every key, it’s easier to pop out a key and replace it in case it gets broken. Over the years of using, the mechanical keyboard will remain to have the same exact feel when typing. Compared to the standard, membrane keyboards, you might be forced to replace the whole thing when one or a few of the keys start to act out. Lastly, if weight is considered to be an advantage, mechanical keyboards ace in that category. Some people easily get frustrated with a lightweight keyboard because it typically slides around the desk, you are assured that a mechanical keyboard can stay in its place. I’s not suggested to just buy the first mechanical keyboard you see. There’s as much information that you need to know about mechanical keyboards and why they are the best option for typing. Hopefully this list has helped you decide which keyboard would best fit your typing needs.